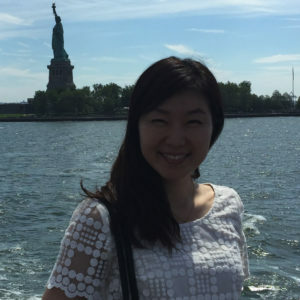 Ji-Young Jung has taught all levels of Korean for the last thirteen years, including Korean for Heritage Speakers and language-and-content courses such as Current Korean Media and Advanced Readings in Korean (using contemporary Korean literature). Prior to coming to Columbia in 2018, she taught at Rutgers University, New Brunswick, and the University of Pennsylvania. She is currently co-authoring Accelerated Korean I and II for the KLEAR Korean Textbook Series (University of Hawai‘i Press). She served on the task force that created College Korean Curriculum Inspired by National Standards for Korean (2015). She is a certified tester of ACTFL’s OPI (used in academic settings) and ILR OPI (used by the U.S. government). Jung, J.-Y., & Lee, E. (in press) Citizen sociolinguistics: Making connections in the foreign language classroom. Korean Language in America. Ha, J. A., Jung, J.-Y., Lee, S., & Eun, J. (2015). Heritage Curriculum Overview. In Y. Y. Cho (Ed. ), College Korean Curriculum Inspired by National Standards for Korean [Special issue]. Korean Language in America, 19(2), 235-272. Cho, Y. Y., Chun, H.-C., & Jung, J.-Y. (2014). Using Film in the College-level KFL Classroom: Applying Theories and Developing Activities. Journal of Korean Language Education, 25(4), 249-275. Cho, Y. Y., Jung, J.-Y., & Park, M.-Y. (2013). Pedagogical Scenarios for Teaching Topic/Nominative Marking in Discourse. Korean Language in America, 18, 40-70. Jung, J.-Y., & Cho, Y. Y. (2011). An Integrated Approach to the Teaching of Business Korean. Korean Language in America, 16, 1-40. Jung, J.-Y. (2010). The Classroom Study on the Efficacy of Interactional Feedback for Korean Particles. Journal of Korean Language Education, 21(4), 255-282. Jung, J.-Y. (2008) Discourse Markers in Cross-cultural Conversation: Festschrift for Professor Leslie M. Beebe, Teachers College Columbia University Working Papers in TESOL & Applied Linguistics, 8(2). Jung, J.-Y. (2001). Issues in Acquisitional Pragmatics. Teachers College, Columbia University Working Papers in TESOL & Applied Linguistics, 2(3).